Basiliscus was the brother of Verina who was the wife of Leo I. After the death of Leo I, his grandson was raised to the throne as Leo II who in turn raised his father Zeno. Verina decided to overthrow her son-in-law Zeno and replace him with her lover, the ex-magister officiorum Patricius, with the help of her brother Basiliscus. The conspirators caused riots in the capital against Zeno and Basiliscus succeeded also in convincing others to join his plot. Basiliscus succeeded is compelling Zeno to flee Constantinople, but he alienated the support of the people of Constantinople. The conspirators quickly fell in conflict with each other and Basiliscus took the throne for himself. He then put to death Verina’s lover and candidate for the throne, Patricius. He then encouraged mobs to hunt and kill all of the Isaurians left in Constantinople. 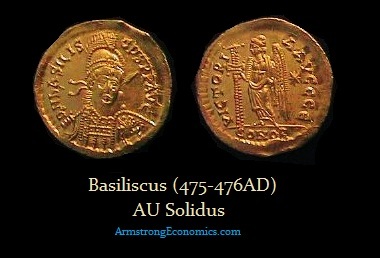 Basiliscus appointed his nephew Armatus magister militum, thus alienating those who had supported him. Since Zeno had taken the treasury leaving no money so Basiliscus imposed heavy taxes to fill his treasury. This alienated the people and the Church. The people of Constantinople also put the blame on him for a great fire that burned several parts of the city. With the secret support of the Senate, and with the help of bribes paid by Zeno, the army mostly deserted Basiliscus and joined with Zeno’s army now marching on Constantinople. Basiliscus tried to recover popular support and sent another army against Zeno, under his nephew Armatus’ command. Zeno succeeded in bribing Armatus too, promising to confirm his rank of magister militum praesentalis for life and promoting his son (also called Basiliscus) to the rank of Caesar. Armatus’ army did not intercept Zeno’s troops marching on Constantinople, and Basiliscus fled with his family to the church of Hagia Sophia. In August 476, Zeno besieged Constantinople. The Senate opened the gates of the city to the Isaurian, allowing the deposed emperor to resume the throne. Basiliscus attempt to seek sanctuary in a church failed for he was betrayed by the Patriarch Acacius and surrendered himself and his family after extracting a solemn promise from Zeno not to shed their blood. Basiliscus and his family were sent to a fortress in Cappadocia, where Zeno had them enclosed in a dry cistern, to die from exposure. After his restoration, Zeno fulfilled his promises, letting Armatus keep his title of magister militum praesentalis and appointed his son Basiliscus Caesar in Nicaea. In 477AD, however, Zeno changed his mind and ordered Armatus’ death. Zeno confiscated all of the properties of Armatus, deposed his son Basiliscus, and had him ordained as a priest.